Heat oven to 350°. Spray loaf pan, 8 1/2x4 1/2x2 1/2 inches, with cooking spray. Discard 3 tablespoons of the pineapple juice. Mix remaining juice, pineapple, egg product and oil in medium bowl. Stir in remaining ingredients until blended. Spread batter in pan. Bake 50 to 55 minutes or until toothpick inserted in center comes out clean. Cool 10 minutes. Remove from pan to wire rack. Cool completely, about 1 hour, before slicing. 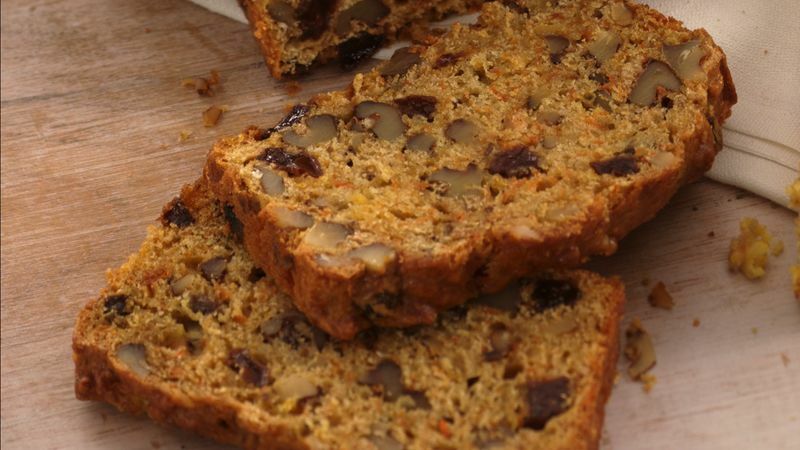 “This is a healthy version of a quick bread, packed with flavorful fruit, vegetables and nuts.” Wanda S.
Breakfast eaters tend to have better overall nutrititious diets than those who skip morning meals. Even when you're in a hurry, you can fuel up with a good breakfast. If you don't have time for a leisurely breakfast, grab a slice of quick bread, a carton of yogurt and a handful of berries on your way out the door.